Wow, hard to believe this is our last walking day. Although slightly weary each morning the days, sometimes lengthy, have not been particularly strenuous. What was a shock today was that the sun was shining at breakfast, the roads and pavements were dry. This was a first and clothes for the day needed new thought processes. For some, shorts were order of the day. After the usual hearty breakfast we soon were walking through Kinlochleven in the sun, noticing that in this sheltered town Spring was showing more than anywhere we had experienced so far. The tranquillity was broken by a trigger-happy chain-saw operator usefully demolishing s hillside of rhododendrons but constantly revving the machine across the whole range of its abilities. We ascended through some woods, building up quite a heat, in the still airs. Across the waters of the loch we could the chain saw revving away, and a plume of smoke from the pyre of rhoddies. The ascent took us into a very distinct, straight, upland glen of the Allt Nathrach, spoiled by a line of wooden power line poles, and hear and there, modern machinery that we found was ploughing a fibre optic cable into the ground, where thankfully, it would not be obtrusive. We reached the bealach at the head of the glen and soon a derelict building (with a “Dangerous Building- do not enter” sign), Tigh na sleubhaich by name. 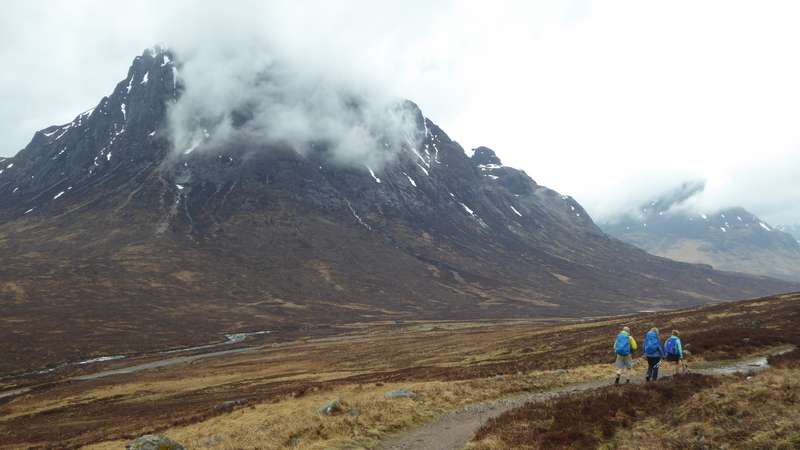 By now the good weather had gone, and we were back to West Highland Way weather, cloud, light drizzle and a cool breeze. A bunch of folk were snacking outside the roofless building, but we ignored the sign and went in for at least shelter from the wind and a bite to eat. We soon headed off, after some of banter with the folks outside, still following an old military road downhill. It passed through some commercial forests felled a few years back and though the land has made good recovery, it is still very obviously felled forest. A glace over our left shoulder to Locahn Lunn Da-Bhra, with some individual scattered Scots pines, looked wonderful, through the mistiness. We stopped, and our three old guys from Kilsyth passed by, they had food today, indeed as it’s the last day walking they had wine and cake which we saw at a later passing where they were using an upright tree stump as a bar table, their wine and cake on top. They didn’t invite us over!!!!. A few minor ups and downs later, we saw our fist glimpse of Ben Nevis, the summit well above the clouds, and after crossing a forested bealach our eyes were cast down to Glen Nevis, our last glen on the way. The drizzle came and went as we descended on wide tracks, now through standing forest. We avoided the turn off to the Youth Hostel and kept going before finally dropping down onto the small Glan Nevis tarmac road, and its footpath leading us to the Nevis Bridge roundabout and the finish of the West Highland Way – well one of them – as the Way has two starting points we found it also has two finishing points! As we arrived a sudden shower of stir rods fell. Everyone except us had dived into the shops for shelter (or to buy some un-needed Scottish souvenir junk). No-one was around to meet us, none of our passing acquaintances had hung around to congratulate us, there was no human being in site. It seemed even Noel, always there to great us at the end of the day, had chickened out due to the weather. In desperation Fran cajoled someone to come and take our photos, in the rain, to record what for us (if not anyone else) was our moment of triumph. 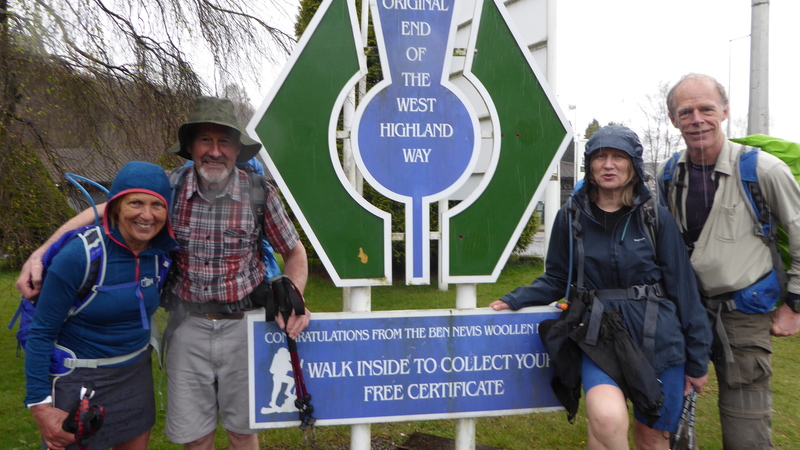 We too dived into the shop at which we were entitled to a “Certificate of Completion” of the West Highland Way. A good bit of PR for the shop and, as they say in Yorkshire “better than n’owt”. Whilst heading for the Alexander Hotel Noel emerged. He and Fran, according to the original trip plan, had a room booked and Bill had his vehicle parked for a quick return to Aberdeen. We changed “el-fresco” in the hotel car park into some more respectable (and dry) clothes and headed off into town for a celebratory refreshment. It was here we found a second “Finish Point”, a “new one” from 2010, at least an extra mile from the original one at the roundabout. It had a bench to sit on, a rock engraved with the route, and a bronze, friendly, bald old man, looking a bit ancient in age and by (bronze) clothing, sat on the bench that allowed you to sit alongside him.!! It wasn’t that welcoming in the drizzle. We moved onto find many of the cafes appeared to “shut for lunch”, not a good PR exercise, but perhaps the way it works in Fort William. We did find one open and had our celebration with tea nd cakes. Todays distance had been 24km, 6 hrs 45 min start to stop (at the second finish point). As our final act we returned to the hotel, bid our self-congratulations and farewells, Fran and Noel stayed on for the night and Bill drove June and James back towards Aberdeen in weather and temperatures that gradually improved to rather fine. The West Highland Way was over for us but for some of our acquaintances along the way on a slower schedule, they would still have another day or two. We met no-one doing it in less than our 6 days. When the going gets tough the tough get going!!! We’ve had big distance days, but today was the big ascent day, the notorious Devils Staircase, stepping up to the highest point on the walk, 550m, and a fair distance too, 34km. 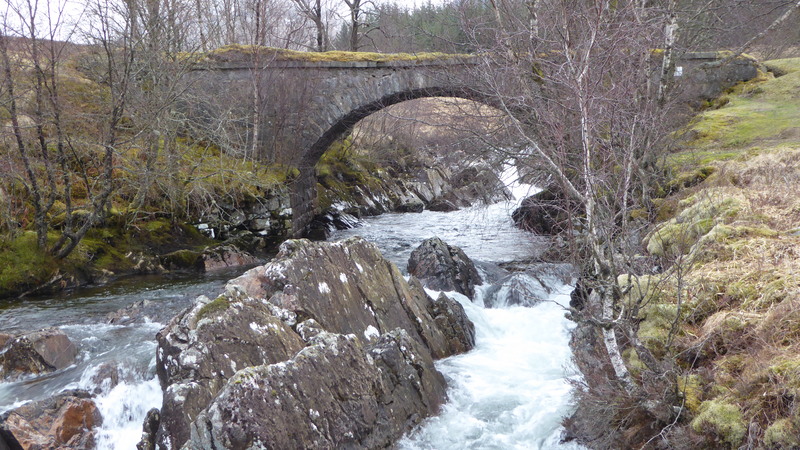 Bridge of Orchy really is in the sticks, a stopping place for road and rail travellers on the river Orchy itself. We immediately crossed the river in damp weather that felt slightly warmer than the past few days. Perhaps a taste of record April temperatures in London and endless sunshine and warmth in Aberdeen, filtering back to us. Certainly, our first ascent through forest warmed us up, but once out on open heath it chilled off. A viewpoint gave new vistas over Loch Tulla and our route downward to Inveroran Hotel close to its shores. Nearby there was a stand of old Scots pines, a change from the deciduous woodlands of Loch Lomond and the never ending planted forests. It was here too the three ladies from Elgin were staying, but we didn’t see them. We crossed Victoria Bridge to Forest Lodge, a rhodendrom enclave, that lead us onto an old road built under a commission given to Thomas Telford in 1803, some time after the military roads of General Wade. As the road gradually ascended, and turned more northward across what is called the Blak Mount or Am Monadh Dubh, we caught our first views eastward across Rannoch Moor, miles of flat peatland full of lochs and meandering burns, all merging together in the grey skies and occasional drizzle. But for brief interludes the sun tried to break through and we thought we saw a glimpse of Schiehallion far to the east. .
Thomas Telford’s road spanned the burns with broad bridges of carefully carved stones and we stopped at one for a break before crossing over again from west to east of the Scottish watershed and arriving at the magnificent bridge over a gorge in the River Ba – the Ba Bridge – with its waters having a long journey through Rannoch Moor’s Loch Ba, and out through the Tay. Telfords road ahead understandably was not down in the bog of Rannoch Moor but elevated up the hillside, to the extent that, despite the words in our written guides for the West Highland Way we were merely viewing from distance and height, rather than being immersed in the unique remoteness of Rannoch Moor. The road soon led us to the much more modern Glencoe ski resort, and the skies broke up briefly to highlight the ski-tows, now silent till the next winter. 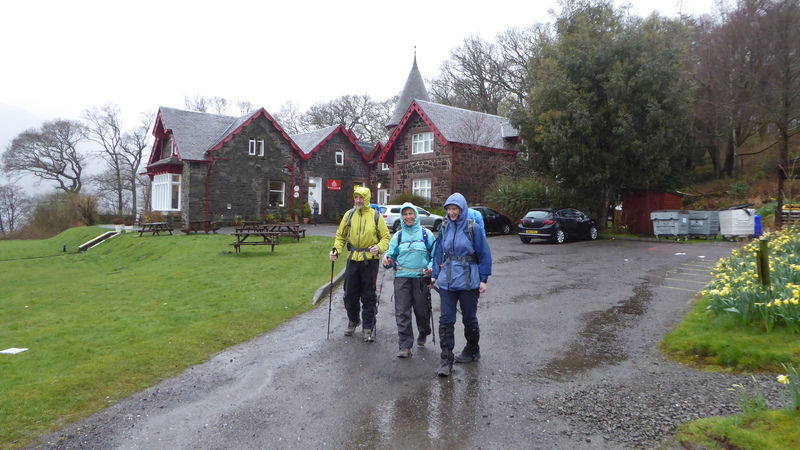 We crossed the main A82 road to Kings House Hotel, a well known establishment for walkers and skiers and dating back to a 17th Century inn, a building still standing. But the old hotel had been demolished in the last 6 months and a major rebuild, controversial for not being sympathetic to the environs, was just starting – it was definitely a building site, and a sore on the bleak open landscape. But as it started to rain we found shelter under a veranda of the workmen’s canteen, for a good bite to eat. We were back on the military road (not Tedford’s any more) and begging for views of the most famous “calendar” hill of this area, Buchaille Etive More, but although the cloud was broken around its summit we never saw blue sky. There were some good patches of snow still lying, something we had not experienced so far along the walk at lower levels. In the distance we could see the massively long Blackwater reservoir which we had glimpsed last year from its other, eastern end, on a walk between Rannoch and Corrour railway stations. It looked very bleak and remote. As a hydro electricity dam its outflow was channelled through some massive pipes down the glen of the river Leven, to the village of Kinlochleven at the head of the sea loch, Loch Leven, – all very logical. It was to Kinlochleven we were heading and although visible far below, we decided to have a break. Our Kilsyth trio caught us up to announce that they had not known that Kings House had closed and as they had planned to eat there, they were now starving. Though reluctant to share our spare food, once they accepted, it was devoured with enthusiasm. As we approached Kinlochleven Noel was there to great us and we found our way to the guest house for the night, Tign na Cheo (House by Cheo). With fractionally better weather today Noel had cycled two circuits on the road network around Loch Leven, a total distance of 85km! He had thus (twice) spotted a local shellfish restaurant, and as it was our last evening meal together we drove there for dinner. The fish/shellfish menu was excellent. Thus the long day was realised, 34km measured. Woke up in our respective little cabins at Ben More Lodges in Crainlarich, not quite fully refreshed after yesterday’s 34km day. A good breakfast though and James managed to retrieve yesterday’s clothes from the staff who had tumble dried them. Typical of the establishment the clothes were not fully dry. 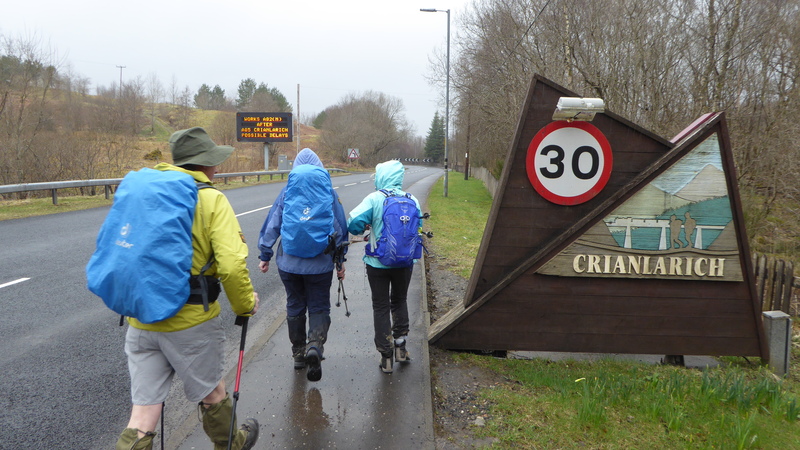 Skies were still grey with drizzle on and off as we retraced yesterday’s steps uphill to re-join the proper West Highland Way on the watershed between tributaries of the Clyde flowing westward and those of the Tay, ending up in the North Sea. We didn’t check the detail of which side the drizzle was falling upon, it was falling everywhere. Our “long” day yesterday projected us ahead of our old walking associates into a new bunch and we quickly got talking to a young German couple from Hanover, on their first long walk together. Ahead of them we caught up with three elderly ladies from Ellon, with little walking experience, but walking in aid of their chosen charities. The path took us through damp forest back down to the main road and railway in Glen Fillan, and then across the flat flood plain pastures of Strath Fillan, well populated with sheep, to the ruins and grave yard of St Fillans Priory, dating from the 12th century. A more modern campground with self contained wooden “teepees” looking more like hobbit homes was passed before we entered Tyndrum, (pronounced Tine-drum) Community Woodland with some interesting information panels describing the activities of Robert the Bruce in the 14th century, and remains of lead mining in the area. It was here too we left the course of the tumbling river Fillian to briefly follow its lesser tributary the Allt Crom. As we approached Tyndrum it was not lead mining we encountered but some everyday folk from a caravan site panning the river for gold, and already in possession of “a couple of flakes”. We were to see more panners later in the day. Tyndrum was about half way for today and required an imperative visit to the famous Green Welly Shop. We avoided purchasing any green wellies, instead going for some food and drink. Refreshed we headed out into the reoccurring light drizzle, upstream walking along an old military road, not built by General Wade, perhaps the best known constructor, but at a slightly later date by his former road inspector, Major William Caulfield who completed over 800 miles of road in the late 18th century. For the most part the road remains in good condition with many beautifully masoned bridge and culverts still standing for us to use a mere 250 years later! At the top of the incline, at around 330 metre elevation, we were for the second time today on the east/west watershed of Scotland in a narrow pass occupied by our old military road, the modern A82 and the railway heading for Fort William and flanked on either side by the mountains of Beinn Bheag 651 metres and Beinn Odhar 901metre, not that we could see either due to the low cloud. We met a hiker unusually going in the opposite direction with whom James struck up a lengthy conservation. He was from Oyne in Aberdeenshire and was walking from the north west of Scotland to Lowestoft in south east England, 45 days of hiking & camping! Professionally he had been Operations Manager of Bristol’s Helicopter in Aberdeen and his and James’s professions must have caused their paths to cross in the 1980’s but today time did not allow to verify this. It was a long easy walk down the military road. Bill had walked in shorts and for the rest waterproof jackets had come on and off many times, but eventually we dropped down to the railway station at Bridge of Orchy, a small cluster of homes, and the Bridge of Orchy Hotel, looking very newly painted on the outside. Noel was there to meet us as usual, having had a non-cycling day. The hotel was very comfortable and after a couple of hours of own-time we had a good dinner and retired around 9.30pm, all fit and healthy though looking at tomorrow, Bridge of Orchy to Kinlochleven as a long day of 34km and a good stiff ascent up the notorious Devil’s staircase. Distance covered today was pretty much as the book, 23km, 15 Miles in 6.5 hours from start to finish. The old military roads are easy, relatively fast walking. Oh dear! It had bucketed it down since around 6pm last night, a full 12 hours, and at the Rowardennan Youth Hosel breakfast, nothing had changed with overcast solid skies and heavy rain. Water was overflowing the gutters of the roof of the hostel and it was wet outside from the heavens to the flooded lawns and woodland. The forecast went for an improvement at midday, but with a 32 km, 20 mike walking Day we couldn’t hang around. A catered breakfast at 7.30 seemed a good idea, and there was a good selection of continental and cooked. We discussed the success of last night sleep, Noel, Fran, and June sharing a private dormitory whilst Bill and James got thrown in with the lions in an eight-birth male dormitory. That was only partly filled, but unfortunately one resident was the snorer, and though he was not loud, the snoring was incessant, there were no interludes to offer any hope of him stopping. The young guy, Dom, a GP from Sheffield, sleeping underneath the snorer was not happy. Other acquaintances showed at breakfast, two tall girls from northern Germany “where there are no hills”, Lucas the first person we met within one mile of the start in Milngavie, the solo German girl who June fansically wanted to match up with Lucas, and Leon the very young looking German solo who HAD walked partway with the girl but had gone on ahead without her as he was camping. We have a longer day today than most so will be jumping ahead and loosing our past acquaintances by the end of today. We were away at 8.00 am in the downpour, with an expected ETD of 6.30 pm, in full waterproofs, leaving Noel behind with baggage transfer responsibilities, not plain sailing as the tarmac road did ended there at the youth hostel, – he had a circuitous route to Crainlarich. Our walking route was simple though, from yesterday afternoon we had been walking on the eastern shore of Loch Lomond, and so would be our next 20 km. The Loch has the largest surface area of any water feature on mainland Great Britain, is over 36 km long, sits only 19m above sea level and in times of past warmer climates and higher sea levels, was indeed a sea loch. 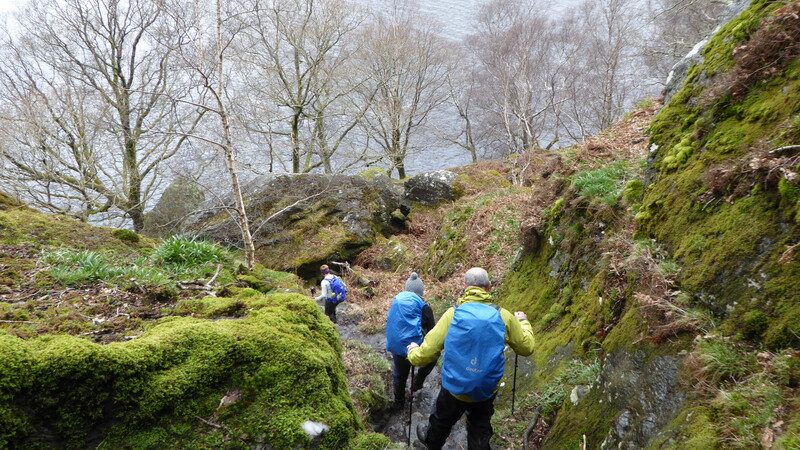 We headed off northward with the loch on our left and the steep hillside of Ben Lomond, on our right. The burns tumbling down the hillside were in spate and often created a spectacular sight cascading down through very attractive natural woodlands of birch, lots of oak, ash and alder. The path was often narrow and twisty with one notorious section, through large cliff-fall boulders. An easier “upper path” was an option according to the guide, but it was not signposted and we missed it. We had a bench mark of stopping approx every ninety minutes for refreshments and even by the fist stop the rain had eased, thankfully sooner than forecast. Across Loch Lomond we could now see the village of Tarbet, but none of the mountaintops behind. Fran caused a scare as her ill-placed pack rolled down the hillside towards the waters of the loch to be saved at the last inch by a blocking boulder. Onward the path took us close to a Rowchoish bothy and on a whim James ran off to check it out. On approach he heard music, so entered gingerly to find the young bespectacled German, Leon, whom we had met yesterday walking with the German girl whose name we never found. Leon reported a comfortable night, entertained by a very tame pine-martin that stole his bag of sandwiches in broad daylight, but in the depth of darkness was found to have unzipped a backpack pocket and pinched some chocolates. Our next stop was Inversnaid, that was accessed via a bridge across the spectacular Arklet waterfalls which appeared to be a Mecca for rhododendrons much to the annoyance of James who muttered something about bringing a saw next time. With road access there was a large hotel and though we attempted to sit outside, we soon fell to the warmth and dryness of the interior for a cup of tea/coffee and homemade cake. Back out into the damp we entered RSPB owned land and quizzed a warden who pointed us towards a buzzard circling overhead. The path continued through delightful woodland with some clumps of primroses, but otherwise little sign of spring, just some tips of green on hazel trees. Along the way we spotted some wild goats, impressive stocky beasts with huge horns and long dull grey coat. Apparently, they are descendants of the domestic goat, though they appear much bigger and stockier. 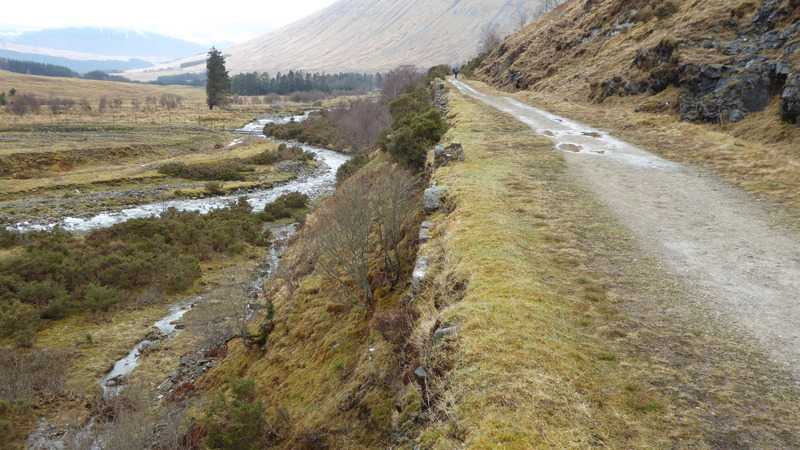 Path conditions varied, sometimes with a good walking surface, other times seriously eroded by water and footfall with over 80,000 persons completing the West Highland Way each year. Towards the northern end of the Loch the terrain opened up, and we came across another bothy, Doune. What a terrible place, the rains had run down the hill and flooded the floor, and outside a full garbage bag was overflowing refuse into the mud that stretched the length of the building. Soon after we kissed Loch Lomond goodbye now following one of the loch’s main inflows, the river Falloch. Although we planned to make a small detour to the Drovers Inn at Inverarnan we were tempted by refreshments directly on the route at Beinglas. As our friendly Falloch’s course took a ninety degree turn for some unknown geological reason we left the glen and ascended onto much more exposed heathland on another old military road. This was the Mecca of hill farming. Although the sheep and cows were not around the military road was awash with excrement and its associated odour, and every type of moorland vegetation was trimmed to a maximum three inches. Along Loch Lomond the expanses of bog myrtle had a show of dark burgundy in its upper stems of last year’s growth at two to three feet high, but here it was just the hard, black woody, knurled stubs that were too tough for the beasts munching jaws. For several kilometres it was a hill-farming desert. The elements also turned against us with the drizzle turning to driving rain on a wind from behind. Eventually we left the hill farming desert behind stepping off the true course of the West Highland Way and dropping down through planted forest to Crainlarich. With no sign of Noel we phoned the Ben More Lodge for directions that proved hard to extract from the flippant proprietor who advised “ just keep walking” without actually telling us in which direction. But we found the place, and Noel who had very bravely been out on his bike in the wet with trucks flying past him in a cloud of spray, was there to meet us. Our rooms were two persons cabins, small but comfortable with the opportunity of drying off our gear, though James went one step further by taking up the offer of the flippant proprietor to tumble dry the clothes. We had good food though, the only other company being a large French family with a child’s birthday celebration, so we joined in “Happy Birthday” and Noel initiated a joint rendering of “Frere Jacques” that went down very well. With that effort and after 34 Km of walking, 2km above what we were expecting, and 10.5 hours start to finish , it was time for bed. We all spent a very comfortable night at the privately run Angel Cottage at Drymen, recently refurbished with very trendy glass, see-through wash-hand basins, totally impractical to keep clean, but trendiness has won over practicality. Fuelled with a full English breakfast, we packed our cases, loaded them into Noel’s car, and set off on our route to Rowardennan Youth Hostel, I suspect to prove not as luxurious as the night just passed. The weather hadn’t changed overnight, it was still relatively cool, overcast with drizzle on and off, but we set off steadily up the tarmac out of Drymen into a planted, damp, dripping forest of tall trees. Our route maps and guide created confusion about alternative seasonal routes on leaving the forest, the criteria being lambing season with a low-level tarmac route alternative suggested. But we never found this on the ground and entered wide open grazing land unchallenged and even when passing three men repairing a sheep fence there was no complaint on our progressing by that route. Our strategy was to stop for refreshments approx every 1.5 hours, and this we did partway up a steepish climb to a rounded (volcanic?) 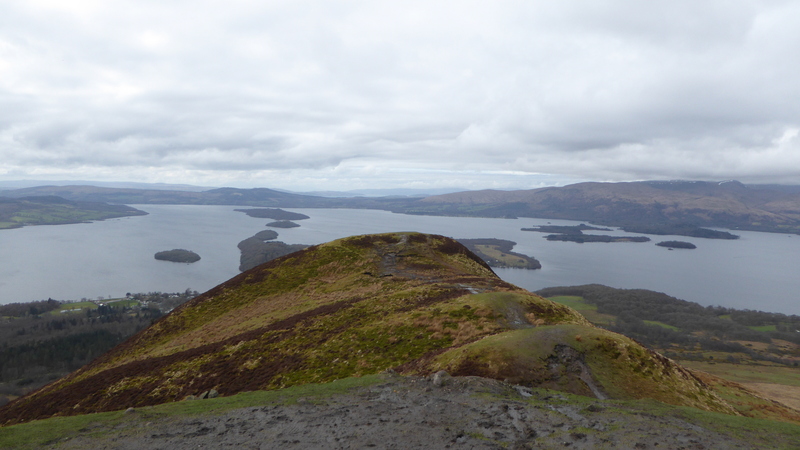 hillock, Conic Hill at 358m. June and Fran had been up it before and as the path skirted its summit they continued on, whilst Bill and James hit the top at 358m. Views would have been good over the southern end of Loch Lomond but it was still mist and drizzle, and a cool breeze in this exposed location. James spotted two Volunteer Rangers and bent their ears about wildlife and geology. From our Conic Hill four islands were in perfect line across Loch Lomond in a south-westerly direction and the line is that of the Scottish Highland Boundary Fault which extends all the way from Ireland to just north of Stonehaven, near Aberdeen, resulting from tectonic activity around 400 million years ago. We also learned that some of the ospreys had returned from their winter in west Africa. Bill and I scooted off down the path to catch up June and Fran, finding them sitting casually outside a café in the tiny town of Balmaha, on the shores of Loch Lomond. It was a quiet peaceful spot and we had refreshments, even visited the cash machine before heading off again. The path took us to the top of a smaller fault hill, Craigie Fort with a special viewpoint constructed to commemorate the opening of the West Highland Way in 1980. The path then plunged back down to shore levels with some rather fine sandy beaches, being lapped by waves coming up the lcch on a south-westerly wind. The path threaded its way between shore and minor public road amongst pretty natural deciduous woodland. The trees showed little signs of spring, with the first leaf buds yet to fully open but on the ground, butterbur was found at almost peak flowering stage, and many small patches of fully blooming primroses, showing bright yellow against the damp dark decay of the woodland floor. In historical times the woodland was the source of oak, used for shipbuilding and the tanning of leather. As we headed north up the coast of Loch Lomond we could see across the waters to the small “port” of Luss, on the western shores. This is where Noel had planned to do some cycling though the weather was not particularly encouraging for that, remaining damp and grey. Along the way we met the other Fran from yesterday, she was hiking and camping and had a camp site just south of Rowardennnan, our destination for the day. The Rowardennan Hotel came first and we couldn’t resist a stop there before walking a further one kilometre to the Youth Hostel, titled inappropriate by name for us veterans. 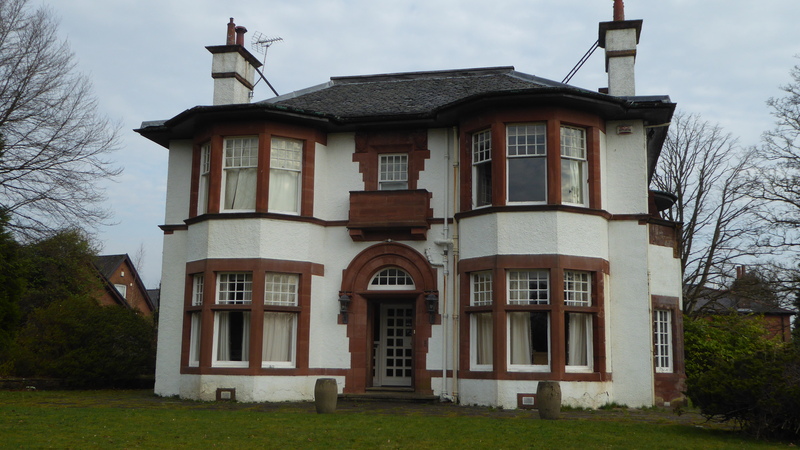 The building itself from the outside was rather attractive, probably a Lochside lodge in the past. Fran and Noel had booked a private room, which turned out to have six bunks in it, June was in a female dormitory, James and Bill, in the male. In the end June’s dormitory was fully occupied, so she took a bed in Fran and Noel’s that offered more space and breathing room. In Bill and James room was the young German lad, Lucas, the first person we met on the whole walk back in Milngavie. We were in good time for dinner at the 7.00pm sitting, so spent some time in the massive lounge, but internet access was very poor. The German girl was staying, the girl June and Fran were trying to match up with Lucas, but instead she was chatting to another young German, whom we later learned to be Leon. Two other youngish females were affectionately entwined on one of the many sofas in this large room. By this time the weather, as forecast, had taken a serious turn for the worse and it was pouring down outside. We thought of Fran in her tent amongst the trees a kilometre or so back up the trail. Youth Hostel dinner was canteen dinner, but not too bad, served by young folk, mainly from overseas. We hit the sack soon after dinner. 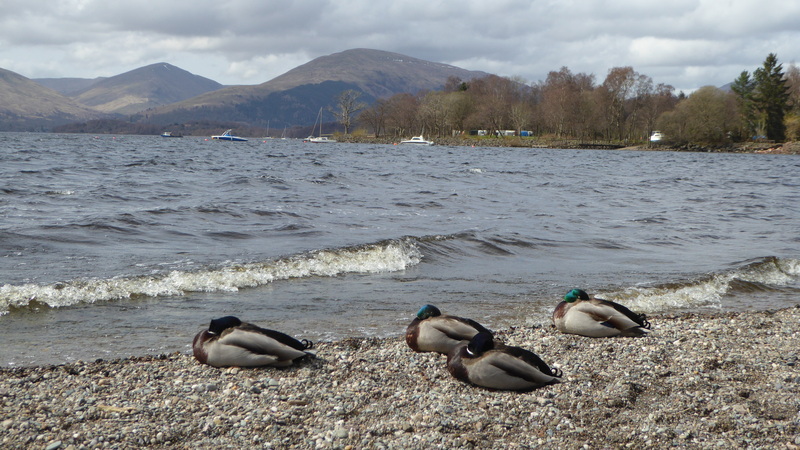 Another good day with some great scenery of Loch Lomond and woodlands, only sunshine was missing. 24 km and just over 8 hours from start to finish. We awoke after a good nights sleep in our Bearsden B & B, enjoying the vast rooms of this former prosperous mansion. Our proprietor, a Glaswegian, Pakistani Muslim had advised us that bacon was not on the breakfast menu, and that we must help ourselves, so that we did selecting from the same homely domestic kitchen that he and his family used. The selection was poor but Bill rustled up a good pan of porridge, and we flavoured it with a selection of fruit, some of which Fran had brought in. Fran even managed to conjure up a cheese and ham roll for us all, primarily using produce she had brought herself. Other idiosyncrasies of our proprietor and his mansion arose, roasting hot radiators but no hot water in the taps; bathroom for those on the ground floor had only a loo and basin, no shower nor bath; an electric extension cable across the carpet of the top step of the stairway, and ultimately the non appearance of the proprietor that morning, we just packed up and departed, never to see him again. At 9.40 we left Millngavie station with full 96 miles of the West Highland Way ahead of us. Within 200metres of the start we met and chatted with a solo, young German lad, Lucas, in shorts and looking very able. The route very shortly took us past a more official starting point in the town centre, an obelisk and massive West Highland Way metal arch way – probably still 96 Miles to go. It was easy walking through the urbanicity of Milngavie, and into the winter dampness of very mature deciduous Mugdock Woods. Occasional bursts of brief sunshine lightened up the dankness of the damp, mossy surroundings and on a few open patches we saw the yellow of celandines and colesfoot brightening up the scene. The path was busy with fellow hikers Sunday dog-walkers and runners heading in both directions. As the woods peeled away, the knarly rounded summit of a former volcanic plum, Dumgoyne at a mere 427metres altitude, appeared on the mid horizon, a hill, a taste of what we expect. Our route was now the same as the John Muir Way and on a well prepared, almost wheelchair useable path and we met up with another Fran who was wild camping the whole route. We stopped for a bight to eat our Fran’s delicious roll with a hazy view over the extensive flat sheep pastures of Strahblane. The walk across the Strath was along the bed of the long defunct Blane Valley railway, which itself was flanked by a raised but earth covered pipeline taking water from Loch Lomond to central Scotland. We couldn’t resist stopping at the very commercialised, Beech Tree Inn at Drungoyne, for a drink and scone/soup/sundae. The old railway track took us some distance, with some quit wet grounds on either side where we found willow in flower, and on just one patch on drier ground some fine butterbur, the first flowering wild flower of springtime. At Gartness we left the railway for tarmac roads and a quant row of stone mill cottages on the banks of the river Endrick Water. A little further the tarmac lead us into Drymen, our stop for the night. Noel was there to greet us, having had a 45km day of undulating cycling, and already checked us in at our B & B, Angel Cottage. How different from last night, a bungalow, extended and fully refurbished to a high standard. Smaller rooms perhaps but lashings of hot water, and a shower in which to bathe. We had arrived early and out of the car Noel produced some wine, cheese and nuts which filled in the late afternoon rather well. Fran iced a sore Achilles. The weather as forecast turned to rain but the Cruachan Inn, our dinner location, was just down the road. June had arranged to meet up with one of her sons and family and ate early, but then joined us in time for desert, and a wee dam of Drumgoyne malt, a distillery we had passed earlier in the day. 21 km measured walking, an estimated 255metres of vertical ascent achieved in five hours, forty minutes, a good “loosening up” day. 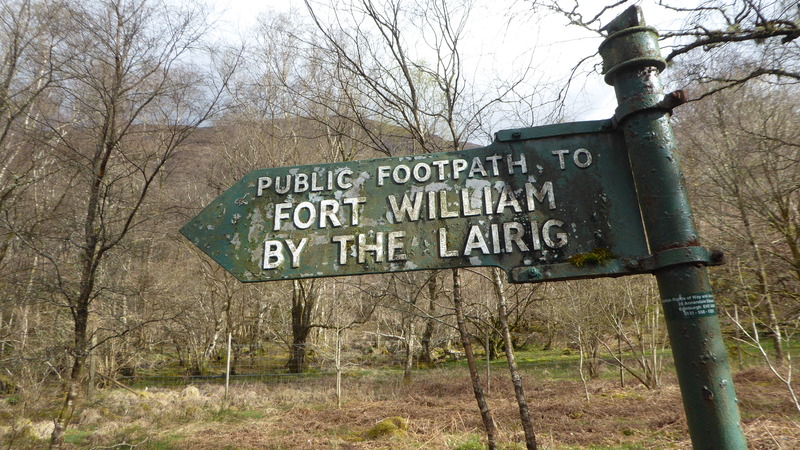 Saturday, April 14 and our outward journey to the start of the West Highland Way. Noel, his wife Fran, and June drove directly to Glasgow whilst I joined Bill and he drove us to Fort William the northern end of the West Highland Way. We made good time and were able to fit in a second breakfast in Fort William, admiring the view of a cloud free Ben Nevis clad in late season snow from the past few weeks wintry weather. We bounded a train heading south to Glasgow, a four hour journey with the line twisting and turning amongst the western Scottish hills and lochs. We were sat opposite an American lady from California who had just completed the West Highland Way and had noted the terrain was shades of brown rather than her expected shades of green. It was true but not suprising after the long cold winter we’ve had. She was away then to Edinburgh, Barcelona and Hawaii -not bad. We arrived in Glasgow and jumped on another train heading towards Bearsden. On phoning Noel we learned they were in the pub at Bearsden station. Bill and I Joined them there for a couple of drinks and a betting flutter online before watching the Grand National horse race. Bill picked the second place horse so his winnings paid for the drinks at dinnertime. It was a short walk from the station pub to our accommodation in Bearsden. It’s 48 years since I was last in Bearsden as a teenager and those times at Hogmanay were somewhat blurred by the overindulgence of alcohol. But parts of Bearsden did seem vaguely familiar from all those years back. The bed-and-breakfast was in a big old house run by Glaswegian Pakistani Muslim who advised us that he wouldn’t be cooking bacon for breakfast! But more important we needed dinner and found a place place close by. Over some good we checked the weather forecast for our first with walking day tomorrow and came up some sort of Plan, it wasn’t rocket science. Then it was just a matter of returning back to the accommodation, a cup of tea and off to bed early in preparation for the six days of walking or in the Noel’s case six days of baggage transfer and cycling.